The spiky yellow woodlouse, Pseudolaureola atlantica, has long been considered a flagship species for St Helena’s highly threatened invertebrate fauna. Woodlice are not insects but ‘isopods’, more closely-related to shrimps and other crustaceans. Almost all species feed on dead organic matter, but the spiky yellow woodlouse is a remarkable exception: it lives its life clambering amongst ferns and trees of St Helena’s Cloud Forest. It is well known amongst islanders for its bright colours and unusual appearance, but not much is known about its life. Numbers are thought to have declined alarmingly since the 1990s and it was listed as Critically Endangered on the IUCN Red List in 2015. It was thought that there were as few as 100 individuals remaining in a single small area of black cabbage tree woodland. In response to the critical situation, the St Helena National Trust and a number of project partners have combined to initiate a rescue plan. This commenced in 2012, when the Flagship Species Fund (Flora & Fauna International/DEFRA) provided a small grant to obtain basic data on the species’ biology. Surveys were conducted in an attempt to find more colonies, and hours of painstaking observations made to study the animals’ daily behaviour. 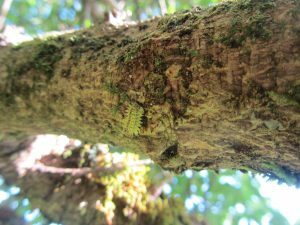 The scientific study provided the basis for the Darwin Plus funded “Conservation of the spiky yellow woodlouse and restoration of black cabbage tree woodland” project (DPLUS025) which ended in 2017. A Conservation Strategy was drawn up for this species by a number of stakeholders in early 2016 and formed the basis of most recent work efforts (Havery et al., 2016). 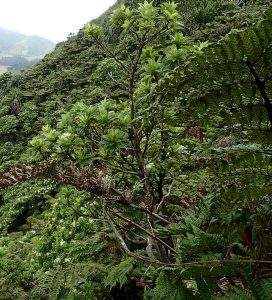 The black cabbage tree (Melanodendron integrifolium) is now the commonest endemic tree remaining in the cloud forest canopy. Unfortunately, extensive stands of black cabbage tree have almost disappeared. The last vestiges of forest are vulnerable to high winds and deteriorating at an alarming rate. The Spiky was thought to be restricted to the understorey of black cabbage tree woodland, a habitat unique to St Helena. Therefore restoration of an area of black cabbage trees was also initiated during DPLUS025. 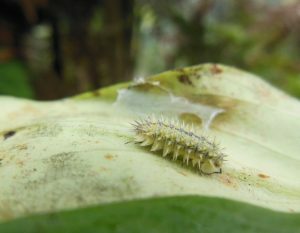 While we now know that the Spiky can be found on a number of plant species in the cloud forest, its largest strongholds are in areas dominated by endemic tree fern and trees. Therefore it is still important to restore and strengthen areas of native vegetation to improve resilience, not only for the Spiky, but for numerous other species restricted to this habitat. The bright colouration and pattern of the Spiky provides a surprising amount of camouflage and individuals can be very difficult to detect. A contiguous project to DPLUS025 focussing on endemic cloud forest trees (DPLUS029) found Spikies in other areas, on other endemic trees, and this collaboration helped to improve knowledge on their distribution in the cloud forest. 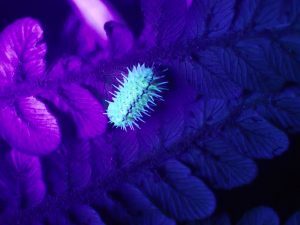 It was found that the Spiky glows under UV light, which made individuals far easier to detect. In an initial trial, an area where there was estimated to be up to 12 individuals in a daytime visit was revealed to have over 30 individuals in a night-time survey using this new method of detection. 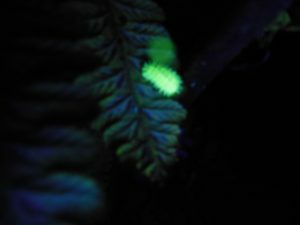 While not all areas of cloud forest were accessible at night, due to sensitive vegetation and difficult terrain, this method vastly improved our knowledge of the species, revealing the true population density, additional locations and individuals present on other plants, including invasive species. The population is now believed to be closer to 1000 individuals, but more work is needed to determine the biology and specific ecological needs of this intriguing and unique species. The conservation programme has been supported by the Royal Society for the Protection of Birds, the Zoological Society of London, Buglife UK, the St Helena Nature Conservation Group and others. We also owe thanks to St Helena Government’s Environmental Management Division who supported fieldwork and supplied plants for habitat restoration efforts.